Having two cameras, one dSLR and one PnS, is a good thing. Depending on the situation and the size of the bag I’m carrying, I can opt to bring one or the other, or both. The downside, however, is I’m hitting more or less the same range of image number on both cameras. When it comes to organising them, I had to be very careful not to let any overwriting from happening. My folder system goes by the event name, and photos from both cameras could potentially end up in the same folder. I should reset the count for one of them. 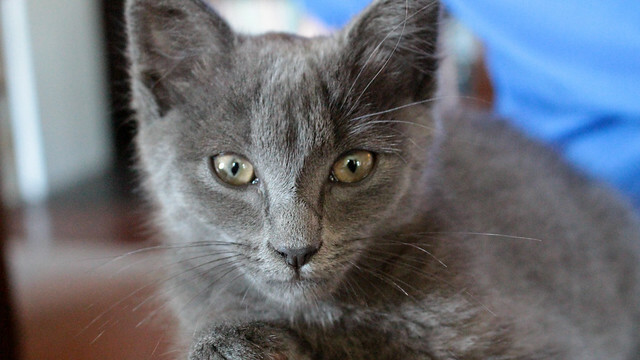 5 Aug: This kitty in real life look like a grey fluffy ball, loves to be petted, super duper cute, but for some reason, when I tried to photograph it, it gave me this serious big cat-like look. I guess it didn’t want to appear too adorable, and it was not too adorable indeed when it jumped on me at breakfast table one morning. It went straight onto my lap and leaving some scratch mark even though I tried to lift it up as quickly as I could. See, I was wearing shorts… ouch! 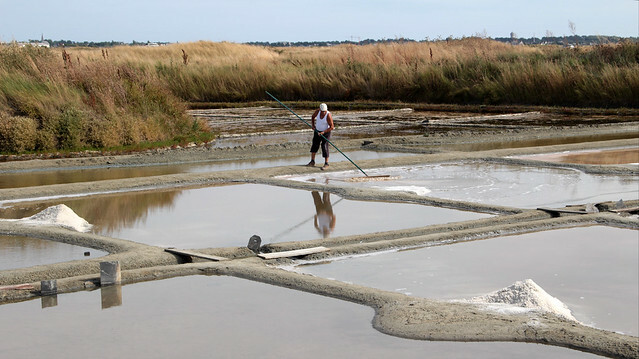 6 Aug: I have been to the marais salant of Guérande a number of times, and each time, I lamented the lack of mountains of salt like those I saw in photographs. Afterall, this is the region where fleur de sel is being harvested. Finally, we hit gold today. With the current weather, if I still am unable to catch this very scene in person, I’d begin to doubt that it’s for real. It was very impressive indeed to see how quickly a small mountain of salt can be harvested within a small well. 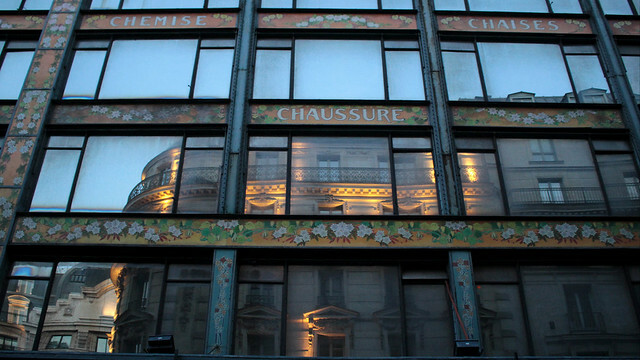 7 Aug: Every time I walk past the building of La Samaritaine, I couldn’t help but feeling sad at the state of what was once celebrated premises of the city. I had only been there once myself, admiring the view of Paris from its rooftop. I never got a chance for a revisit as it shut down in 2005, supposedly for works to meet the building security and safety standards but then actually embroiled in some employment term scandals and the accusation that this was a mere tactic to terminate its workers’ contracts. It will not reopen as a deparment store anymore in any case. The last I heard, a hotel is to be built. 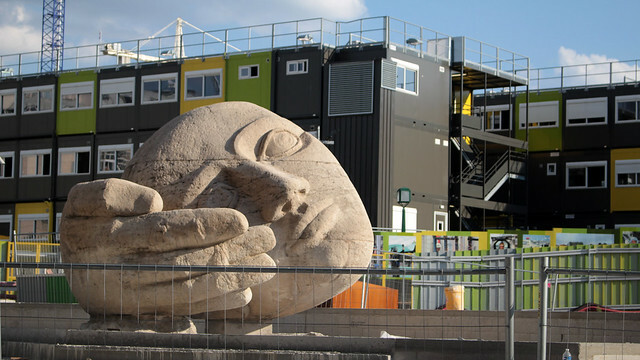 8 Aug: The works at Les Halles are still ongoing, and one of the few unfortunate things that happen is the barring off of this sculpture by Henri de Miller from the public. Aptly titled “Écoute” (i.e. listen), it evokes a want to tell a secret that this sculpture would hold in silent confidence. This floating head was also once a playground for excited children, those who wanted to be cradled by the giant hand, and those who wanted to climb all over the head. It’ll be a while yet before this is made possible again. 9 Aug: I’m having all kinds of strange Asian food craving of late. Maybe it’s because my trip home is looming in the horizon, and I’m starting to mentally preparing a check-list of all the delicious things I want to eat. After last week’s Tibetan lunch, Céline, Amélie and I went to a Korean restaurant for lunch today. 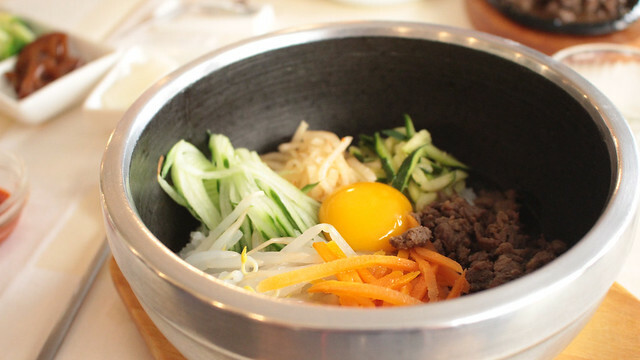 Bibimbap accompanied by some grilled dumplings, six small side dishes (to share between us) and a bowl of miso soup, all for €10, it’s a bargain indeed! 10 Aug: The line 6 always seems to be packed, and on days when the weather is particularly wet and/or windy, my friends have told me to avoid it as delays would often happen, given parts of the line that run above-ground. However, it is thanks to the above-ground portions that we see a bit more of Paris than the dark (and graffitied) tunnels of underground trains. 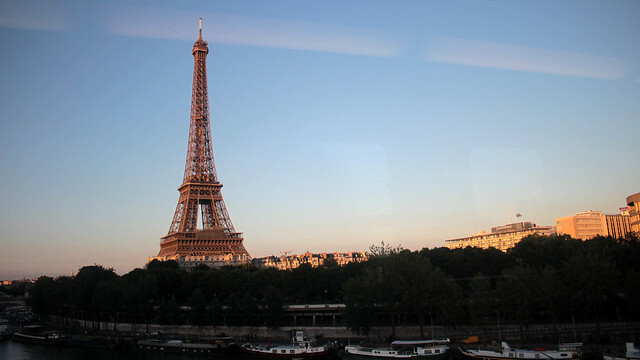 I have always love crossing the River Seine between Passy and Bir-Hakeim for this very view – simple thing, but enough to remind me of what a charmed life I am living. For that, I am grateful. 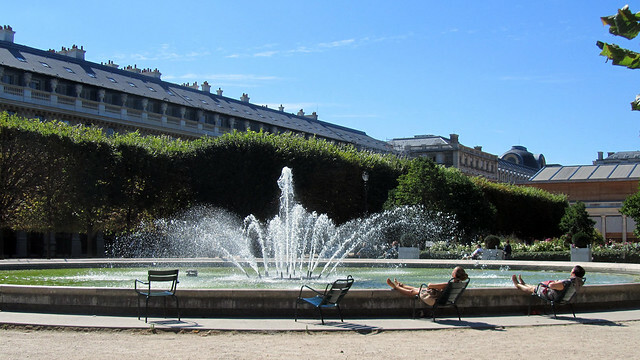 11 Aug: When it is a sunny and a sleepy Sunday morning, for those who live near to a beautiful and calm park such as the Jardin du Palais Royal, this is what you do – sit by the fountain and do nothing. Or maybe read a book or listen to some songs on an iPod and the likes. How lucky my friends Efi and Brian are, for they have just recently moved not 5 minutes walk from here. We have the lovely Jardin du Luxembourg near to us, but it is inevitably a lot busier for it is one of the most visited parks in Paris. in the meantime, beware stray cats and stray claws! lily sometimes forgets that she has claws and “kneads” us gently when we pet her. silly cat.